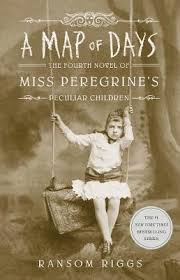 A Map Of Days : Miss Peregrine's Peculiar Children Book 4 - ubiq bookshop: the best place to buy books! Having defeated the monstrous threat that nearly destroyed the peculiar world, Jacob Portman is back where his story began, in Florida. Except now Miss Peregrine, Emma, and their peculiar friends are with him, and doing their best to blend in. But carefree days of beach visits and normalling lessons are soon interrupted by a discovery -- a subterranean bunker that belonged to Jacob's grandfather, Abe. Now, the stakes are higher than ever as Jacob and his friends are thrust into the untamed landscape of American peculiardom -- a world with few ymbrynes, or rules -- that none of them understand. New wonders, and dangers, await in this brilliant next chapter for Miss Peregrine's peculiar children. Their story is again fully illustrated by haunting vintage photographs, but with a striking addition for this all-new, multi-era American adventure -- full colour. Featured in the November 2018 Great Reads newsletter.